Nowadays, users are increasingly using the Internet to find all kinds of shops and other places of interest. Beyond just having a website, being able to see the environment and contemplate the interior of business is something that attracts users and puts any company in a privileged position compared to their competition. Being a Google+ indexed business and having a 360 Google Business View tour makes your more easily reacheable in internet searches. It is estimated that 62% of total customers use Google to search online for restaurants and hotels, among other types of business. ... just get in touch with me for a photo session and Google and me will do the rest! Your business can be there too. What are you waiting for? Check out the website to learn more, or contact me for questions or to schedule the session. I am an Engineer in Computer Systems from the Ramón Llull University. 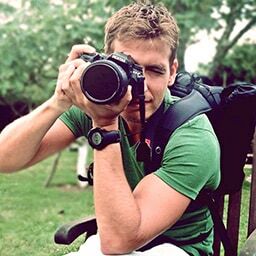 I have undertaken the Digital Photography subject from the Multimedia Degree and I am a web developer and entrepreneur contents of various kinds as well. I am now in the process of being a Certified Trusted Photographer from Google Business View to take quality virtual tours in the area of Barcelona. If you still don't know what Google Business View Virtual Tour is, it will only take a few minutes for you to see what has to offer. If you already know the basics and want to know more about the process, then you can go directly to see the steps to register your business (if you don't already have) and to schedule a photo session. Street View, Now for your business! Google Business View Virtual Tour is a new and exciting online marketing tool that uses Google Street View technology from Google Maps to allow your clients to enjoy a fully-interactive 360º virtual tour through the inside of you local, pretty much like if they where there in first-person. The use of this service aids in positioning your business in a higher place in Google Search, Google Maps, Google Sites and Google+ as well, putting you one step ahead from your competition when it comes to online presence. In addition, the virtual tour is not only accessible from Google Maps, as it can also be easily added to your corporate website, blog or Facebook fan page. Google Maps Business View pack can include up to 15 photos of the main points of interest, allowing you to highlight important aspects of your business, like the main room setting , products, menus, opening hours, etc. Are you interested? Then you may be glad to know that having your Google Virtual Tour is an extremely easy and accessible process consisting of 3 simple steps. Most likely your business already appears in Google My Business. If that's not the case, registration is free and only takes a few minutes. You can ask any questions you might have via the Contact form and if you are interested, we can schedule a day for the session. Depending on the local setting and the number of panoramic captures needed, the process might take between 30 minutes and a few hours. For a more professional result, it will be better if the day of the session there is little affluence of staff and customers, being the ideal moment off business hours, and with good lighting. After the photo shoot, I'll take care of the rest. The process requires working with the tools from Google and is subject to a short period of time during which Google checks that the result meets the quality standards required by them. Once finalized, in a few days the 360º virtual tour and your business photos will be ready for your potential customers to see. There is nothing like watching a real case to be made to the idea. The following tour was conducted in an optical shop. It is a two-floor store and a total of 10 panoramic pictures were taken over a period of about one hour. In just 48 hours they had the tour available in Google Maps. Click on the door to enter the shop. You can navigate freely inside! 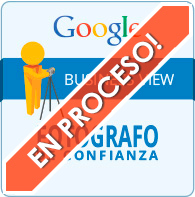 Having presence in Google Business View is very affordable and highly profitable. Register is free of charge and the total cost is derived from the work involving the development of the virtual visit through Google tools. Once finished, remaining in service is free. It's that simple! You can contact me easily to book a session at this phone number +34 677 30 17 14 or by sending an email or a message through the contact form at the bottom of this page. If you have any doubt, I will be happy to assist you personally.